A wound is an injury to the living tissue on your body, caused by a variety of reasons, typically leaving the skin cut or broken. Treating a wound depends on a number of factors like the size, severity and the depth of the wound; along with the prevailing medical conditions of the patient if any. While dressing, or plastering the affected area, an adequate amount of pressure needs to be applied so as to stem the bleeding to wrap it up properly. 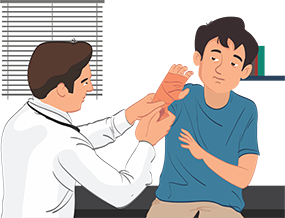 This requires a certain amount of expertise, and thus, it is advisable to visit a clinic and let a professional practitioner administer the plaster or the dressing. At Apollo Clinic, we understand the importance of medical treatment for injuries and wounds, and therefore, we provide you with the best dressing or plasters for your wounds in our treatment rooms. What is the Difference between a Dressing and a Plaster? A dressing is a sterile pad that is applied to a wound as it helps promote healing and prevents it from further harm. A dressing is designed in a way, as to be in direct contact with the wound as compared to a bandage that is usually used to hold a dressing in place. On the other hand, an orthopaedic cast, also known as a body cast, surgical cast or a plaster cast is a shell that is made from plaster or fibreglass. A plaster is often used to stabilise and hold the structures, mostly broken bones until they are healed. What are the Primary Purposes of a Dressing? To stem bleeding: helps to seal a wound and quickens the clotting process. Absorption of exudate: helps to soak up the blood, plasma and other fluids that are exuded from the wound, avoiding the spread of it and preventing maceration. Protection from infection: protects the wound and prevents attacks from germs and other damage. Eases the Pain: helps alleviate the pain by compressing the wound and preventing it from further harm. What are the Primary Purposes of a Plaster? An orthopaedic cast or plaster cast is often used in the treatment of fractures. The primary objective of a plaster cast is to immobilise the part of the body, to allow the two parts of the affected bones to heal in the right position. A plaster cast is mostly used for sports injuries or injuries that are severe and affect the bone. At Apollo Clinic, we understand the importance of treating injuries and wounds. Therefore, we provide you with world-class services and facilities to treat your injury, particularly with dressings and plasters. With the best treatment rooms, we assure you a hygienic treatment and healthy recovery.